Seat USB adapter interfaces for Seat Altea Ibiza Leon and Toledo. Connect USB devices such as portable hard drives and USB memory sticks full of your favourite MP3 music files and play the audio through your Seat factory fitted car stereo. Suitable for Seat models with the Grundig Aura, Beta, Scala, Alana and Blaupunkt factory fitted car stereo models. 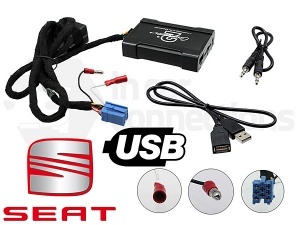 Seat USB adapter interface CTASTUSB002 for Seat Ibiza, Leon, Toledo, Ahambra, Altea, and Exeo. Connect USB memory sticks and SD cards full of your favourite MP3 music files and play the audio through your Seat factory fitted car stereo. For 2005 onwards models with Quadlock connector. 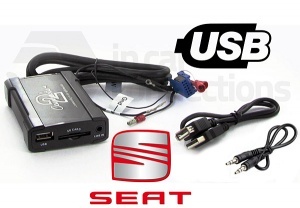 Seat USB adapter interface CTASTUSB003 for Seat Ibiza, Leon, Toledo, Ahambra, Arosa, Cordoba and Vario. Connect USB memory sticks and SD cards full of your favourite MP3 music files and play the audio through your Seat factory fitted car stereo. For pre 2005 models with Mini-ISO connectors.